McElfresh Map Co. is pleased to announce that its cartographer and historian, Earl B. McElfresh, is the author of an atlas of contemporaneous Civil War maps published by Harry N. Abrams, Inc. 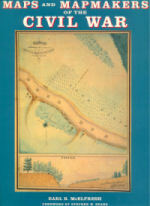 The book, entitled Maps and Mapmakers of the Civil War is on sale now. The book was a History Book Club Main Selection in September 1999. 180 illustrations, 150 in full color. A narrative describing the necessities, uses and production of maps during the Civil War. 16 biographies of Federal and Confederate topographical engineers and wartime photographs of each. A foreword by renowned Civil War historian Stephen W. Sears. Nothing like this atlas of Civil War maps has ever been presented. It is a delight for Civil War enthusiasts and map connoisseurs alike. Gary W. Gallagher called Maps and Mapmakers, "An exceptional book." James M. McPherson said, "The book will be a prized possession in my Civil War collection. Splendid." Paul W. Romaine of the Gilder Lehrman Collection called the book, "Beautiful and important." Mike Vogel of the The Buffalo News said, "Astoundingly, this is the first and only thorough examination of Civil War maps yet produced." The book is available at book stores, map stores and park sites throughout the country and is available through many Civil War and military book catalogs. Earl B. McElfresh spoke about his book and the maps on December 2, 1999 at the North Shore Civil War Roundtable, Huntington, NY. C-Span 2 Book TV televised the talk, which was broadcast repeatedly throughout 2000. Please click here if you wish to view the presentation on the C-Span website.